When recently having read German Orientalist Tilman Nagel’s voluminous opus maximum on life and legend of the prophet of Islam, I became once more interested in the different versions of Muhammad’s ascension to heaven and his night journey to Jerusalem which had already been combined in the earliest surviving text on his life, Ibn Ishaq’s (d. 761) Sirat Rasul Allah (“Life of the Messenger of God)”, edited by one of his students, Ibn Hisham (d. 830 CE). Largely powerless, his preaching oppressed, his followers brutally persecuted, Muhammad had tried, just 18 months before emigrating to the city of Yathrib, to reassert himself by telling strange stories about night journeys. According to the Kitab al-Tarikh wa al-Maghazi by another biographer, al-Waqidi (d. 822), the prophet ascended to heaven on Ramadan 17 (621 CE) when having a nap at the Ka’aba in Makkah. A ladder (mi’raj) was put up by the two angels Jibril (Gabriel) and Mikhael (Michael) between the Zamzam well and the station of Ibrahim (maqam Ibrahim). Then, all three climbed up. After having met other eminent prophets and having had a close look at hell and paradise, Muhammad received the order to commit ritual prayers five times a day, and after having accomplished the descent, Jibril informed him about details of the rites. Muhammad did not follow Umm Hani’s advice not to talk about his night journey. The Quraysh quickly contested that it would have been possible to travel to Jerusalem in one night and scrutinized the story. According to a hadith by Ibn Katir “the Quraysh were asking me (Muhammad) about my Night Journey. They asked me things about Bayt al-Maqdis (Jerusalem, the Temple Mount) that I was not sure of, and I felt more anxious and stressed then I have ever felt. Then Allah raised Bayt al-Maqdis for me to see, and there was nothing they asked me about but I told them about it.“ So, it must be concluded that Muhammad had never been in Jerusalem before. What Did the Prophet Actually See in Jerusalem? But what had he seen when in Jerusalem? After its final destruction in 135 CE by the troops of Roman Emperor Hadrian who brutally cracked down the Bar Kokhba revolt, Jews were no longer allowed to settle there. Christianity was still a forbidden religion. The city was renamed Colonia Aelia Capitolina. Hadrian ordered that a temple for Aphrodite was erected. The entire province of Iudaea became Syria-Palaestina. When Emperor Constantine I (d. 337 CE) became a ruler of the Roman Empire in 324 CE, Christianity got its chance. His devout Christian mother, Empress Helena, while having been traveling the Holy Land at a time when Christianity had been legalized throughout the Roman Empire, had discovered the hiding place of what was held the True Cross, used for the crucifixion of Jesus. Amazingly, her son, Emperor Constantine, renewed the prohibition on the residence of Jews in Jerusalem. Jews were only allowed to mourn for the destruction of their temple once per year, on the 9th of the Hebrew month of Av. In 325, Constantine convened the Council of Nicaea which established a largely privileged status for the Bishop of Jerusalem. Helena discovered in the holy city the site where Jesus has allegedly been crucified, buried, and resurrected, and Constantine ordered to build the Church of the Holy Sepulchre (or Church of Resurrection), and the Church on Mt. Zion commemorating the Last Supper. As a result of Constantine’s promotion of Christianity, Jerusalem flourished again after several centuries and became a center of pilgrimage for the whole Roman Empire. In the fifth century, the city was further expanded by Eudocia, wife of Emperor Theodosius II, who ordered to build further churches in Jerusalem. Emperor Justinian erected in 543 CE another large church in honor of the Virgin Mary, called Nea Ekklesia of the Theotokos. It was completely destroyed by an earthquake in 746 and never re-built. The Byzantine rule in Palestine ended when, after a siege of 21 days and massive bombardment of the city walls with ballistas, the Sassanid army under General Shahrbaraz eventually conquered and looted Jerusalem in 614 CE, and massacred its (mainly Christian) inhabitants. Most of the churches including the Holy Sepulchre were burned down. The True Cross was taken as a trophy to Ctesiphon. This was four years after declaring Muhammad’s prophecy, eight years before hijra. Persian rule lasted for some 15 years, and in 629 Heraclius re-conquered the city, seven years after hijra. He triumphantly returned the True Cross to the re-built Holy Sepulchre. Only nine years later, the Islamic Caliphate extended its dominion to Jerusalem. The rashidun Caliph Umar ibn al-Khattab signed a contract with Patriarch Sophronius assuring the Christians and their holy places that they will now be protected under Muslim rule. The Holy Sepulchre had been rebuilt and redecorated in 1048. Coming back to the question regarding Muhammad in Jerusalem, what did he actually find on the Temple Mount? Oleg Grabar’s Book on early Islamic Jerusalem, The Shape of the Holy (Princeton University Press, Princeton, New Jersey 1996) provides some computer-generated views of Jerusalem as it probably looked around 600 CE. While the Holy Sepulchre and Nea are prominent landmarks, the area of the former Temple is empty. (Note that the al-Aqsa mosque has been built by the Umayyad Caliph al-Walid in 705, a couple of years after Abd’ al-Malik’s Dome of the Rock.) But these sacral (Christian!) monuments lay more or less in ruins when Muhammad arrived on his mythical mount in 621. When the Quraysh asked him about details and Allah raised Jerusalem before his face, did He show him the Christian city in ruins? Or the empty area on top of the Temple Mount? At least since the Mishna in 200 CE Jews face the Jerusalem Temple Mount in prayers. So did Muhammad even after having arrived in Yathrib, later called Madinah, in 622. The following year, while leading the prayers in a mosque, he got a revelation by Allah (surah 2, 144) to turn the qibla to the Ka’aba in Makkah. So, two-and-half years after his miraculous visit to Jerusalem from where he ascended to heaven, he finally turned his interests towards Makkah. 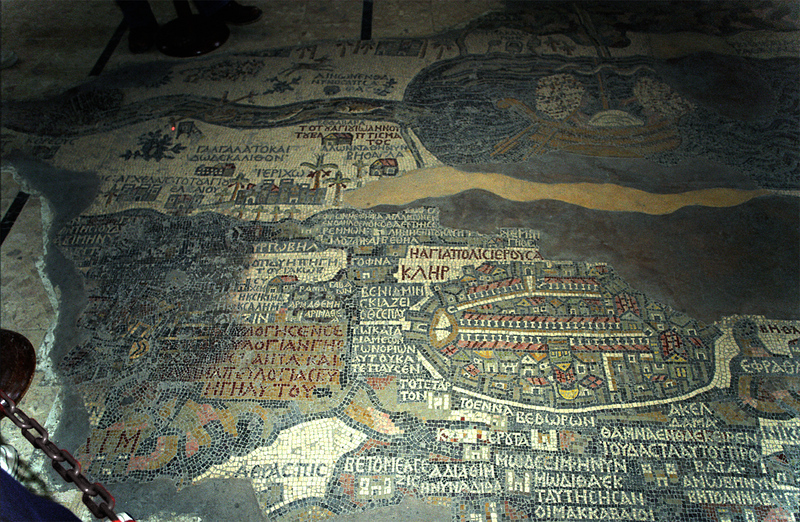 The picture shows the Madaba (in Jordan) mosaic map of Jerusalem in the mid or late sixth century. The (northern) Damascus Gate to the left, (eastern) St. Stephen’s Gate as well as the Holy Sepulchre (west) and Nea church (south) are discernible. This entry was posted in Christianity, Islam, Judaism and tagged Al-Isra’ wa Mi’raj, Constantine I, Eudocia, Holy Sepulcher, Ibn Ishaq, Jerusalem, Madinah, Makkah, Muhammad, Nea, Night Journey, qibla, Sassanids, Shahrbaraz, Temple Mount, True Cross. Bookmark the permalink. Thank you for this history !! (which is the improvement of the other islam-documents.com, once based in Tunisia). PS: just dare to do the same in your own language!!! It ‘s fun.